(TheForceField.net ) October 30, 2007 — Users of Leopard are reporting partial or total failure of wireless connectivity after installation of Apple's new version of its operating system, according to comments in Apple's blog . Users complained of slowdowns in wireless connections to the point of complete disconnection. The initial post by "nunofgs" described the problem. "When you connect to your wireless network, your transmit rate will be 54. (if you're using the 54g standard). If you start up a download or something that occupies your bandwidth (even LAN traffic), you will notice that the transmit rate drops to 11, then to 3, then to 1 until finally your downloads will drop, your ichat connections will fail and your browser will not load pages. " One user known as "osxy" wrote "This morning i recieved my copy of leopard and installed it on my iMac (core 2 duo 2.16ghz first generation iMac). And I got 1 big problem, Airport, with airport i got a very bad connection. When i open several sites at once my ping to my modem shoots up from 2ms to 3k ms and basicly my whole network is useless." The problem was not limited to Airport. Other users observed the issue with other devices as well. DCYorke said "Also having a problem with my D-Link access point. I would like to add I seem to be having the same type of symptoms with my Verizon Wireless ExpressCard connecting to their 3G network." Users suggested a myriad of fixes but as of today had not found a common cause nor solution to the problem. All, however, called on Apple to fix the problem, and quickly. As of this afternoon Apple had not posted a solution. A2B Tracking Solutions Inc. has published a new White Paper titled "Data Management Excellence – Eradicate UID Compliance Errors with Data Management," aimed at Department of Defense (DoD) contractors and military personnel who must report legacy and government furnished property to the DoD's IUID Registry. Portsmouth, RI (PRWEB) October 30, 2007 — A2B Tracking Solutions Inc. has published a new White Paper titled "Data Management Excellence – Eradicate UID Compliance Errors with Data Management," aimed at Department of Defense (DoD) contractors and military personnel who must report legacy and government furnished property to the DoD's IUID Registry. The purpose of this latest White Paper is to clarify what goes into managing the data behind the compliance process. To that end the document enumerates automatic identification technology (AIT) best practices that must be employed to ensure accurate data in the IUID Registry database of DoD-owned items. It also argues for precise and "fail-safe" data management, including the collection of good data that remains associated with pedigree information throughout an item's lifecycle. UID Comply!® product manager, Jim Daniels, says "This White Paper needed to be written. While UID compliance may seem simple in concept, successful implementation calls for precise data management throughout a complex, multi-step process. Readers of the document will want to weigh the evidence it presents carefully, in order to avoid a minefield of potential errors." The new White Paper will be featured in the Fall Edition of A2B's newsletter, UID Quarterly, due out the first week of November. Anyone wishing to receive an early copy may do so by emailing pchasse@a2btracking.com. Put White Paper in the subject line. About A2B Tracking Solutions Inc.
A2B Tracking Solutions Inc. is the leading provider of total solutions for bar code tracking. Most recently A2B has developed UID Comply!® a total solution software suite that streamlines the UID compliance process. Since it was founded in 1994, A2B has lead the bar code industry movement into mobile computing, developing a state-of-the-art mobile tracking system for one of America's largest parcel delivery companies. Principals of A2B include founders of the bar code industry who have lead innovations in applications for 40 years. To date, A2B has completed more than 2,000 tracking installations around the world. For more information about A2B Tracking, visit www.uidsolutions.com or phone 800-733-7592. Innovative approach allows users to leverage existing infrastructure while increasing alarm network reliability and reducing operating costs. (PRWEB) October 30, 2007 — Dantel, Inc. the leader in network surveillance and management systems, announced today the availability of its E2A over IP solution to seamlessly convert existing E2A alarm equipment from analog to TCP/IP networks. "Dantel recognizes that service providers face a challenge with tight capital and limited personnel to update alarm networks," said Dave Lauger, director of business development for Dantel, Inc. "To address these issues, Dantel has developed an E2A/IP solution to leverage investments in existing alarm systems. This solution allows service providers to easily transition from legacy analog networks, which are expensive to operate and maintain, to TCP/IP networks." Dantel's innovative approach will increase alarm network reliability while reducing operating costs. Existing E2A equipment, Dantel or other types, may be easily and quickly adapted to IP transport using two Dantel E2A/IP components. In addition, the company's solution does not poll the equipment at remote sites, since polling may not always synchronize alarm events with the host resulting in errors and missed alarm notification. Dantel's approach ensures the highest level of communication reliability. Dantel's design consists of an E2A subassembly at remote sites and the Dantel WebMon Matrix at the host site. This combination delivers a clean and reliable conversion process that has been extensively tested with NMA. Further, no configuration changes are required at the host. "At remote sites the E2A/IP subassembly directly replaces an existing analog modem, therefore no additional relay rack space is required. The existing alarm shelf can be IP ready within a matter of minutes," added Lauger. The WebMon Matrix modular construction allows end users to customize their remote monitoring with a blend of discrete, analog, and event based intelligent auto control functions for service assurance. Applications for the Matrix include but are not limited to Central Offices, Switch Sites, Cellular or WiFi Sites, and Head Ends. The Matrix may be populated with up to six modules. Modules may include discrete inputs, 8, 16 or 32 per card; analog inputs 8 per card; discrete outputs 5, 8, or 10 per card; and terminal server ports 4 per card. Optional features include Ethernet Switch, fiber interface, and cellular modem. The WebMon detects events, converting and reporting the information in various protocols including SNMP v1, v2c and v3 traps and v2c informs, TL1, ASCII and DCPF, and interfaces to HP Open View, IBM Tivoli Net Cool®, CA SPECTRUM or Dantel's VisionMaster™ or VisionMaster CS (Client Server) Network Management System. For over 35 years, Dantel has been a recognized leader in the design, development and manufacture of surveillance and management solutions for critical infrastructure protection. As a Microsoft® Certified Partner we provide our customers with advanced solutions and benefits unsurpassed in our industry. Today's business climate demands cost-effective, secure and reliable methods for remote monitoring. Today, more companies are demanding Dantel. For more information on Dantel, call 800-432-6835, or visit us at www.dantel.com. Big Blue's Capabilities Stagnating While Major Competitors Re-emphasize WCM Technologies. Silver Spring, MD (PRWEB) October 30, 2007 — CMS Watch, a vendor-independent analyst firm that evaluates content technologies, has found that IBM's Web Content Management (WCM) technologies have been stagnating at a time when competitors are paying greater attention to web publishing toolsets. This analysis stems from CMS Watch's 2008 "Web CMS Report," released earlier this month, which evaluates 30 major Web Content Management (WCM) offerings. As part of its ongoing research, CMS Watch interviews hundreds of web managers around the world. IBM's competitors have been busy in the past year. Microsoft rebuilt its WCM services from scratch under Office SharePoint 2007. EMC is re-investing in Documentum's WCM capabilities. Oracle acquired Stellent, an ECM vendor with a strong focus on WCM. None of these products are without their flaws, but each has seen substantial attention of late. In the meantime, IBM's Workplace Web Content Management (WWCM) product remains a generation behind, and it is conceivable that IBM may simply elect to acquire a WCM vendor to fill the gap. CMS Watch cautions that IBM WWCM customers may risk the kind of painful upgrade or even replacement of the kind endured by Microsoft Content Management Server (MCMS) licensees when Redmond rewrote that tool under SharePoint. To be sure, the IBM WWCM product has some strengths. It can be integrated with WebSphere Portal Server, and the contributor interface has been localized in multiple languages. The product is comparatively feature-poor, especially with respect to globalization services, at a time when many large customers are re-examining their web publishing operations in a global context. WWCM suffers from a legacy of bugginess (somewhat redressed in a recent dot-release), a comparatively very quiescent customer community, and much less publicly-available information than other IBM server products. "Workplace Web Content Management seems lost at IBM," argues CMS Watch Founder, Tony Byrne. "That doesn't mean current licensees should stop using it," Byrne added, "but it does mean that Big Blue customers should not automatically implement WWCM without carefully considering other alternatives." The 2008 Web CMS Report includes detailed comparisons of 30 vendors across 18 key feature categories, as well as evaluations of individual product suitability for 12 universal CMS scenarios. A separate European Edition focuses on vendors active in that region. The Report is available for purchase online from CMS Watch. CMS Watch(tm) evaluates content-oriented technologies, publishing head-to-head comparative reviews of leading solutions. Through highly detailed technical evaluations, CMS Watch helps sort out the complex landscape of potential solutions so that buyers can minimize the time and effort to identify technologies suited to their particular requirements. To retain its independence as a totally impartial analyst firm, CMS Watch works solely for solutions buyers and never for vendors. CAMBRIDGE, Mass. (Business Wire EON) October 29, 2007 — Bit9, Inc., a leading provider of application control and device control solutions, today released its annual list of the top popular applications with known vulnerabilities. Often running outside of IT’s knowledge or control, these popular applications can be difficult to detect and remove. The list, published as a research brief entitled “2007’s Popular Applications with Critical Vulnerabilities” was designed to help IT departments regain control over their desktop environments. 1) Runs on Microsoft Windows. 2) Is well-known in the consumer space and frequently downloaded by individuals. 3) Is not classified as malicious by enterprise IT organizations or security vendors. c. with a severity rating of high (between 7.0-10.0) on the Common Vulnerability Scoring System (CVSS). 5) Relies on the end user, rather than a central administrator, to manually patch or upgrade the software to eliminate the vulnerability, if such a patch exists. To discover the other applications on the list and what to do about them, please visit http://bit9.com/2007vulnerableapps. Readers will learn about a five-step approach recommended to control vulnerable applications within the enterprise. Bit9, Inc. is the leading provider of application control and device control solutions. The company’s award-winning, patent-pending whitelisting technology prevents malicious software and data leakage by centrally controlling which applications and devices can and cannot operate. Unlike other application control and device control alternatives, Bit9 leverages the world’s largest knowledgebase of application intelligence to achieve business-friendly whitelisting, enabling IT professionals to realize the highest levels of desktop security, compliance, and manageability. Founded in 2002 by the founders of Okena (acquired by Cisco Systems (NASDAQ: CSCO)) and headquartered in Cambridge, Massachusetts, Bit9 is a privately held company. For more information, visit http://www.bit9.com. Bit9, Inc., Automatic Graylists, FileAdvisor, Find File, Parity, and ParityCenter are trademarks or registered trademarks of Bit9, Inc. All other names and trademarks are the property of their respective owners. (PRWEB) October 29, 2007 — Light Beam Industries, LLC, a leading technology firm dedicated to providing eco-efficient lighting solutions utilizing its patented wave guide, diffraction grading and LEC materials, has developed a new Solid State Designer LED-C™ (Light Emitting Diode Converters) System. The Solid State LED-C™ Material is based on patents created by inventor Daniel Naum. 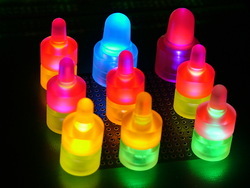 This new material gives the ability to create a system in which a monochromatic or White LED is used and then the Solid State Lighting source is embedded in the LED-C material, creating a monolithic component, which then converts all of the energy from the LED and re-emits at the color chosen. The LED – C™ material generates light by a wavelength photoptic process of absorption and emission in the cross-linked polymeric materials. The shorter wavelengths of the light from the solid state emitting source are absorbed completely, or partially if preferred, and then re-emitted as light at longer wavelengths which are determined by the color of the material chosen. The new designer LED – C™ can, through wavelength manipulation, produce colors and hues not available in standard LED's. President Mark Benson states, "The LED – C™ also offers a new way to generate white light, using multiple LED – C™ colors, and allows us to produce white light from 3000 degree K to 6000 degree K with a completely accurate color distribution. You no longer have to rely on the "bin allotment" to control the quality of light from your LED's." "The designer LED – C™ can produce wavelengths from 440nm to 660nm with current drive levels from 5mA to 400mA and has a life expectancy of up to 100,000 hours, "CEO John Darland states. This means that there are no longer color gaps in the visual spectrum where LED's are concerned. LED – C™ material has a wide variety of potential applications which range from exact color matching in signage needs to low power – high output brilliant colors in instrument panels and switches as well as other scientific applications. By utilizing LED – C™ for your LED color needs, you not only accomplish brilliant color output in any color of the visual light spectrum but you're getting the light using very low power consumption. LED – C™ uses fluorescent dyes in a polymeric matrix and solid state light source to generate multicolored light as well as true white light from 3000K to 6000K. This patented material also gives you the ability to create one, two and even three or more colors generated simultaneously from a single solid state monochromatic color. "We've not found another material that would allow you to produce such a broad light spectrum range while utilizing LED's for your power source. We can now create the deep red's that, for example, Coca Cola and Budweiser require for their signage and there are a million other applications as well, says John Darland – CEO." Future research and development will focus on nano-crystalline lasing structures incorporated in a plastic matrix (paint-on nano lasers) with further potential applications in lighting, solar collection, visual displays as well as search and rescue. Mark Benson – President said, "The future is bright and LED – C™ Designer LED's create tunable – consistent colors for a vast range of applications many of which were previously unobtainable." LBI specializes in eco-friendly high performance Fiber Optic Lighting Systems. Utilizing our patented technologies, we are able to provide the most innovative and efficient products including Illuminators, Fiber, Light Panels, Fluorescent Material (LEC's) as well as solid state custom lighting projects. Our mission is to provide the world with superior products and services, using innovative solutions that improve the efficiency of lighting with fiber optics and cold light technologies to satisfy our customer needs, in an eco-friendly manner. ComputerShopper.com today announced winners of its Hot 100 Awards. The awards recognize Computer Shopper editors' top 100 favorite tech products of the past 12 months in seven categories. New York, NY (PRWEB) October 27, 2007 — Computer Shopper magazine and http://www.ComputerShopper.com today announced winners of its Hot 100 Awards. The awards recognize Computer Shopper editors' top 100 favorite tech products of the past 12 months in seven categories. "Our Hot 100 awards recognize outstanding products and services that represent the best tech products you can buy," said Sean Portnoy, Executive Editor, http://www.ComputerShopper.com "We have seen innovation on a grand scale that is shaping the trends in the tech landscape reflected in this year's winners." The Hot 100 award winners were announced today at http://www.ComputerShopper.com/hot100 and in the November 2007 print issue of Computer Shopper magazine. Winners were chosen in the following categories: Desktops, Laptops, Mobile, Hardware, Software, Internet Services, and Home Theater. In addition, Computer Shopper editors named the Product of the Year. This year's Hot 100 list shows the gains Hewlett-Packard has made against formerly dominant Dell in both desktops and laptops, and the absolute dominance Google commands in the field of Internet services. And for the second year running, Apple and Intel have won the Product of the Year and Technology of the Year awards, a sign that both companies have regained their clout in the computing world. In print and online at http://www.computershopper.com, our expert staff of technology editors helps readers cut through technology-buying clutter with focused editorial that is informative, relevant, and actionable. Computer Shopper offers in-depth product reviews, comparison tools, and buying advice that empower users with the information they need to make purchasing decisions. SX2 Media Labs serves passionate technology enthusiasts online and in print. With a focus on niche technology audiences, the company is rapidly expanding its footprint in technology media. MXSweep reports on massive outbreak of MP3 spam by stock market pump-and-dump fraudsters. This brand new type of email borne spam has been flooding users since last week, and in a very short time accounted for around 7 – 10% of all spam sent worldwide. These worthless stocks are being promoted as MP3 based voice messages with deceptively sounding names like Santana.mp3, bspears.mp3 or coolringtone.mp3. (PRWEB) October 27, 2007 — MXSweep reports on massive outbreak of MP3 spam by stock market pump-and-dump fraudsters. This brand new type of email borne spam has been flooding users since last week and in a very short time accounted for around 7 – 10% of all spam sent. These worthless stocks are being promoted as MP3 based voice messages with deceptively sounding names like Santana.mp3, bspears.mp3 or coolringtone.mp3. This represents yet another evolutionary step in email spam. For years we had grown accustomed to text based spam, a format still in widespread use today, then came a global outbreak of emails carrying image spam based on GIF or JPEG formatted graphic payloads, with spammers then switching to PDF & Excel attachment spam, and now for the first time we are seeing more spam campaigns based on MP3 based spam. Each evolutionary advance poses a tougher challenge to the anti-spam industry as traditional filters struggle to keep up. According to Danny Jenkins, MXSweep CTO and founder, "Spammers are using new techniques everyday to penetrate spam filters, and as their methods become more and more advanced traditional keyword and baysion filters are becoming less effective in the global fight against spam." As the keynote speaker at an MXSweep Reseller Conference in Dublin today, Danny told the audience, "The vast majority of businesses are already blocking audio files or will have no issues implementing corporate policies to block audio files from arriving by email into the user's inbox. Although these emails now account for 8% of current traffic they consume up to 55% of email bandwidth use, which in business terms is a huge additional cost. By using the MXSweep hosted email filtering service, MXSweep advanced spam filtering allows business to block the latest spam threats including MP3 spam, without the need to implement overzealous policies. In addition, all of the filtering in performed in the cloud so the additional bandwidth requirement is not an issue for the customer. " MXSweep provides a comprehensive suite of hosted email security services, including Anti-Virus, Anti-Spam and Anti-Fraud capabilities for server and network protection. Taking less than one hour to deploy, MXSweep's managed service protects companies and employees against the liabilities of spam and viruses transmitted over email. MXSweep's threat management services help companies increase the availability and reliability of their email and IT infrastructure. Headquartered in Dublin, Ireland, MXSweep serves the international market through a global network of channel partners. The company has been awarded Premium Checkmark Certification status by the independent West Coast Labs on the strength of MXSweep's ability to block all email-borne spam, fraud, phishing, and identity theft attempts, as well as viruses, and mail server attacks. Applying multiple layers of perimeter protection technologies across a clustered network of secure data centres, the MXSweep email protection service provides the comprehensive and accurate filtration required to purify today's business email from all threats. The service is popular with organisations of all sizes, ranging from SME/SMB sector businesses right up to large multi-national corporates and government departments. The MXSweep solution is a fully managed service with 24/7 monitoring to guarantee system availability. Market demand for MXSweep's email protection continues to increase, with international sales increasing at double digit rates. Copenhagen, Denmark (PRWEB) October 26, 2007 — SPAMfighter Exchange Module (SEM) 3.4.0 was recently released with improvements to the core spam detection engine, optimized speed, better support for exchange cluster users, and additional features geared towards creating a more secure business environment for the SMB market. The SEM core engine has also been updated to give better spam filtering, now blocking the latest forms of spam mails, including PDF and image spam that threaten businesses around the world. "Our team has developed the most powerful SEM module SPAMfighter has ever provided, with improved speed in both the SEM engine, and menu control," said Alix Aranza, Managing Director of SPAMfighter North America. "This upgrade is designed to give businesses in the SMB market improved security so they can focus on growing their business, and not on the constantly worrying about e-mail security," added Aranza. The administration module and system e-mails are now offered in French. To read the full report on the latest SEM update, click here. SPAMfighter is Europe's leading spam filter developer. The Danish company is owned by the founders of Jubii.dk, Henrik Sørensen and Martin Thorborg, together with two programmers, Daniel Hjortholt and Martin Dyring. SPAMfighter employs 35 people and is based in Copenhagen. SPAMfighter North America is based in Boca Raton, Florida and is headed by Alix Aranza. SPAMfighter is debt-free and is 100 per cent financed by income from the sale of the SPAMfighter client. Each day, SPAMfighter removes around 19 million spam messages from 22 million tested emails received by over 3.9 million users in 216 countries/regions. The recent California wildfires have destroyed homes, downed power lines, and ruined telecommunications, severing all forms of contact for families and businesses. Users of cable, DSL, and dial-up internet service have experienced outages because of dependence on cable and telephone lines. However, the few internet users of HughesNet, a satellite internet provider, have not experienced a loss of communication or vital rescue information like others. Laguna Niguel, CA (PRWEB) October 26, 2007 — The recent California fires have cut off communication and internet service for some customers of cable, DSL, and dial-up service. Fires raging areas such as San Diego, Orange County, Malibu, and the Inland Empire have destroyed homes, downed power lines, and ruined telecommunications, severing all forms of contact for families and businesses. Crews throughout the fire ravaged areas are currently working to restore power, telephone, and internet service, but with so much destruction it will be long before widespread internet service is restored. Many communication providers will not begin to make service calls to homes or businesses in the recently burned areas for days (possibly weeks), creating problems for families and businesses who primarily get their news via the internet and further hinders their ability to contact friends and family through email and voice-over-ip (VOIP) phones. In several of the wildfire areas, homes were previously denied broadband by internet service providers because they lived in rural areas of California. As a result they chose HughesNet, which is available nationwide, as their high speed internet provider. Because satellite internet service is not dependent upon telephone or cable lines, these HughesNet customers did not lose their internet connectivity, allowing them to continue communicating with loved ones. While covering the fire many noticed trucks and emergency response vehicles that had small satellites on their roof – a similar variation of HughesNet for emergency response communications vehicles. During these tragic and destructive fires, the technically independent internet service provided by HughesNet offers peace of mind to homes and businesses. For those who may be unable to receive conventional broadband internet service or need backup internet access, HughesNet satellite internet is available. Satellite Family is a nationwide authorized HughesNet reseller based out of Laguna Niguel, CA. For more information about HughesNet visit www.satellitefamily.com. Questions can be directed to 1-866-430-8170 or author@satellitefamily.com.